I’ve read Uncanny Magazine sporadically since they started publishing, but I finally decided to back their Kickstarter and subscribe for Year Three. I’d definitely rate that among my best decisions of 2016, not least of all because it means that I’ve gotten to start off 2017 with a brand new issue that is jam-packed full of the usual sorts of excellent stories, poetry and essays that have been characteristic of the publication since the beginning. Sam J. Miller’s “Bodies Stacked Up Like Firewood” centers around a trans man’s suicide, and is the first story to make me cry in 2017. Miller deftly and sensitively explores the grief of his characters, utilizing a slight speculative element for a haunting effect that left me perfectly primed for reading the second story that has made me cry this year, A. Merc Rustad’s “Monster Girls Don’t Cry.” I just recently read Rustad’s lovely “This is Not a Wardrobe Door” in Fireside, so I was excited to find a second of their stories so soon and thrilled to find that this one is even better than the first. I’m a huge fan of stories where outsiders come to own their identities, and I love a literal metaphor, so “Monster Girls Don’t Cry” is right up my alley. I fully expect it to be one of my favorites of the year. Kassandra Khaw’s “Goddess, Worm” is nice but not terribly memorable. “The Thule Stowaway” by Maria Dahvana Headley is rather long and challenging, especially if you don’t know the works and biography of Edgar Allan Poe very well. I could see it being a great favorite for the right reader, however. From Theodora Goss comes “To Budapest, with Love,” which is a thoughtful meditation on ideas of alienness that I didn’t find that compelling. “Some Cupids Kill With Arrows” by Tansy Rayner Roberts is a charming and funny romance that I will definitely be linking to all my classics-loving friends when it’s free to read on February 7 (and hounding them to just buy the issue in the meantime). The Ann Leckie reprint, “The Unknown God,” is fine, but not as exciting as some of her other work that I’ve read. I’m no poetry expert, but I loved Nin Harris’s “Jean-Luc, Future Ghost” and even think I understood it. Longer poems by Carlos Hernandez and Nicasio Andres Reed round out the section but are beyond my ability to critique other than to say I liked them. Mark Oshiro offers an important perspective on and critique of Fantastic Beasts and Where to Find Them in his essay “Inferior Beasts.” Natalie Luhrs makes an excellent case for romance in “Why You Should Read Romance” and Angel Cruz’s essay, “Blood of the Revolution: On Filipina Writers and Aswang,” is fascinating. The standout essay of the issue, however, is Delilah S. Dawson’s powerful “I Have Never Not Been an Object.” Finally, Julia Rios, in her second issue as print interviewer, talks with A. Merc Rustad and Maria Dahvana Headley, who each offer some great insight into the stories they had in this issue, their respective processes, and what they’ll be up to next. 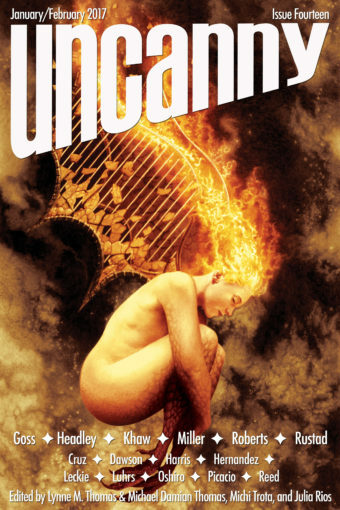 Like any collection of fiction and essays, Uncanny Magazine #14 has its highs and lows subject to the reader’s tastes, but it’s overall a solid issue of an above average publication. Even the pieces that didn’t especially speak to me personally were obviously chosen with care for their high quality, and I continue to be extremely happy that I finally decided to become a subscriber.